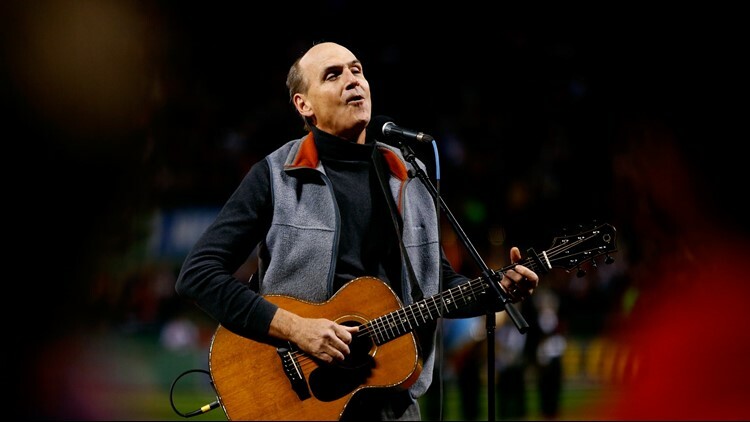 James Taylor sings the national anthem prior to Game Two of the 2013 World Series between the Boston Red Sox and the St. Louis Cardinals at Fenway Park on October 24, 2013 in Boston, Massachusetts. Taylor has made no secret of his Red Sox fandom. The 114th World Series between the Los Angeles Dodgers and Boston Red Sox begins Tuesday night from historic Fenway Park, and the Sox are bringing in a local hero for some good luck. Boston native and music legend James Taylor will sing the national anthem prior to Game 1 tonight, according to his Twitter account. The Rock and Roll Hall of Famer had previously performed the song during the Sox's previous three trips to the Fall Classic, most recently in 2013. Perhaps it's no coincidence Boston won the series each of those times. Taylor, who maintains a home in Lenox, Massachusetts, has made no secret of his Red Sox fandom, even recording the song "Angels of Fenway" in 2015. Taylor is expected to sing at approximately 7:56 p.m. eastern time, with Game 1 starting roughly 10 minutes later.